General Description: As a hybrid between black knapweed and brown knapweed, meadow knapweed can have variable characteristics between the parent plants. It is a perennial that typically grows between 1 and 5 feet tall. Flower Description: Flower heads are solitary and terminal on branch tips. Bracts at the base of flower heads are light to dark brown and have papery, fringed margins. Bracts have a metallic gold sheen when plants are flowering. Flowers are rose purple to white. Leaf Description: Leaves not divided, up to 6 inches long and 1.25 inches wide with smooth or slightly lobed or toothed margins. Leaves decrease in size up the stem. Fruit/Seed Description: Seeds are white to light brown in color and may have a short row of hairs on one end. 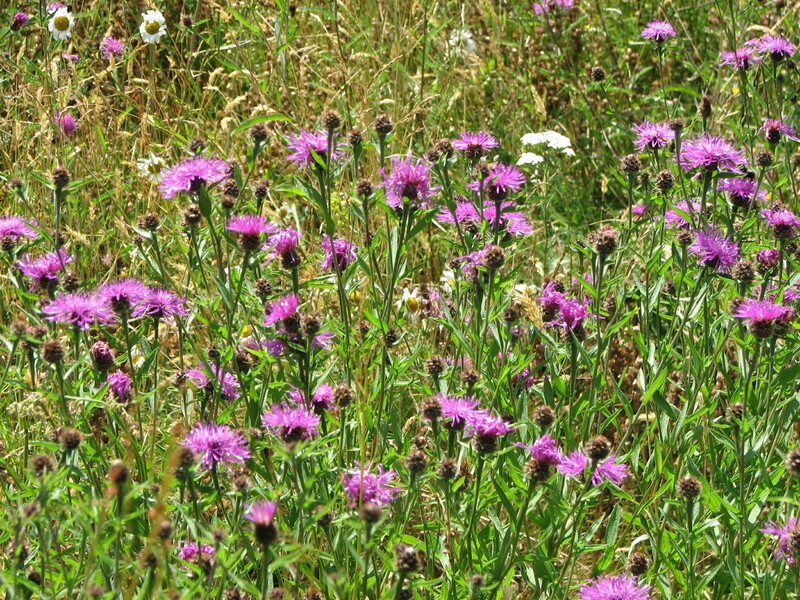 Meadow knapweed is an aggressive invasive species that spreads into pastures and meadows. It outcompetes desirable forage plants as well as other native plants species.